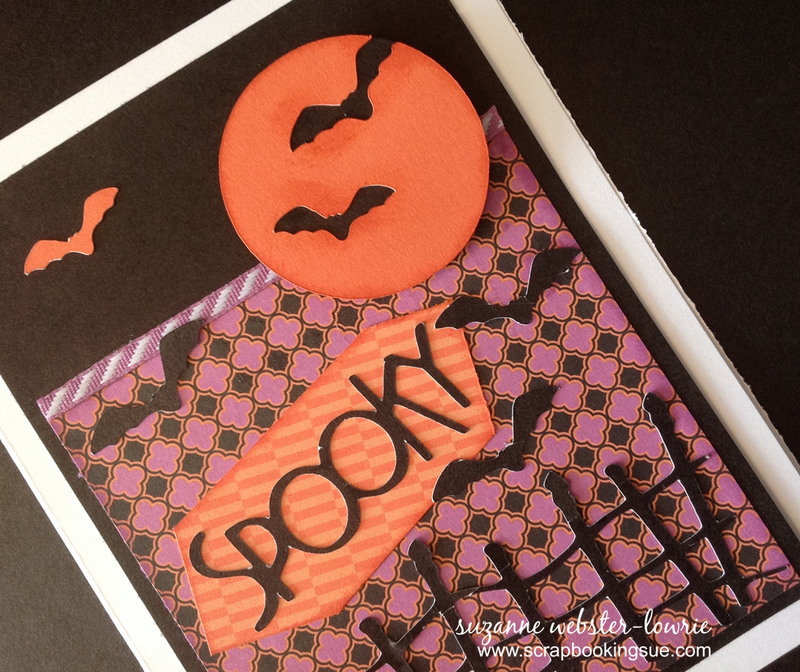 This “Spooky” card was made almost entirely with the CTMH Artbooking Cricut Cartridge! I began with a 5.5″ x 4.25″ White Daisy cardstock base and Black cardstock overlay. The purple and orange patterned papers came from the Scaredy Cat Paper Packet. Using the Artbooking cartridge, I cut the moon-with-bats cut-out in Sunset cardstock, and all of the other elements – fence, “Spooky” sentiment, and bats – in Black cardstock. The orange bat in the night sky was one of the cut-outs from the moon. The Sunset pumpkin was stamped from the “Frightfully Fun” stamp set, fussy cut, and glued on to the card. To finish it off, I added a strip of Thistle Diagonal Striped Ribbon across the top of the card and popped the moon off of the page with foam tape. I will be linking this card to the Color Dare Color Challenge #116, found here, Freshly Made Sketches Challenge #159, found here, Heart 2 Heart Challenges (Midnight), found here, and the Fantabulous Cricut Challenge Blog (Halloween projects), found here. 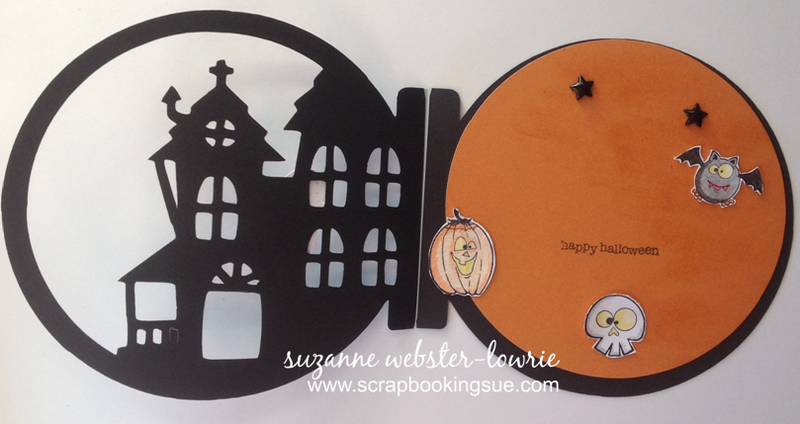 Here is a fast and fun Halloween Artbooking card made with the CTMH Cricut Artbooking cartridge. 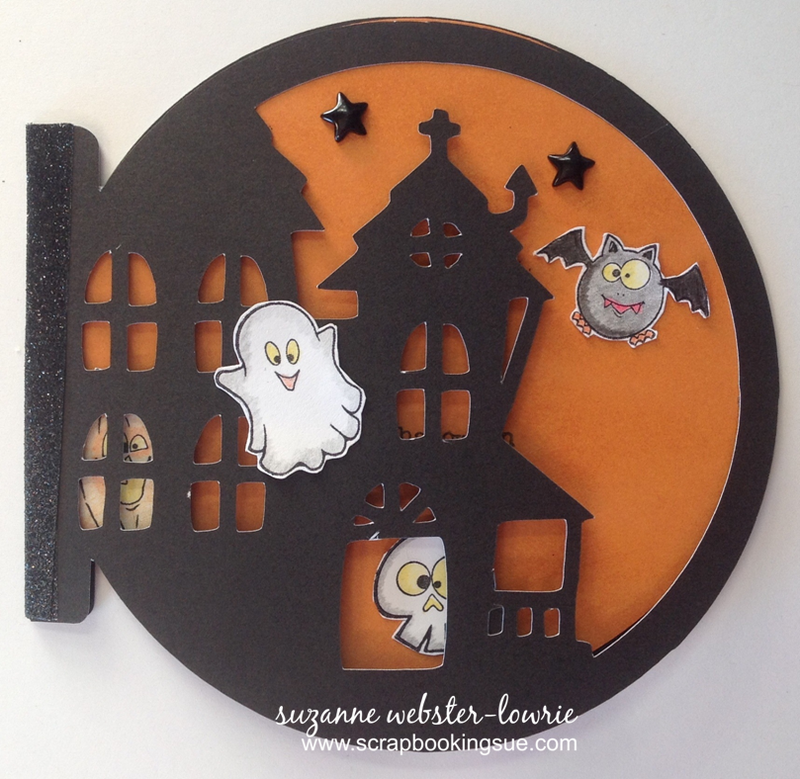 I actually used 3 cut-outs (cut at 5.5″)… the card front (with the haunted house cut-out), the card back (plain shape), and the orange inlay. I arranged the card front and back shape individually on my Cricut mat so that they would merge together and become an actual card… however, I did not “weld” the shapes together (easy mistake!) and ended up with 2 pieces. I attached the card at the left edge with a couple of pieces of Black Shimmer Trim to hold everything together and make it an actual card. I sponged the inside Goldrush circle with Goldrush ink to create a bit of a nighttime cloudy look, and added 2 black enamel stars to the sky. 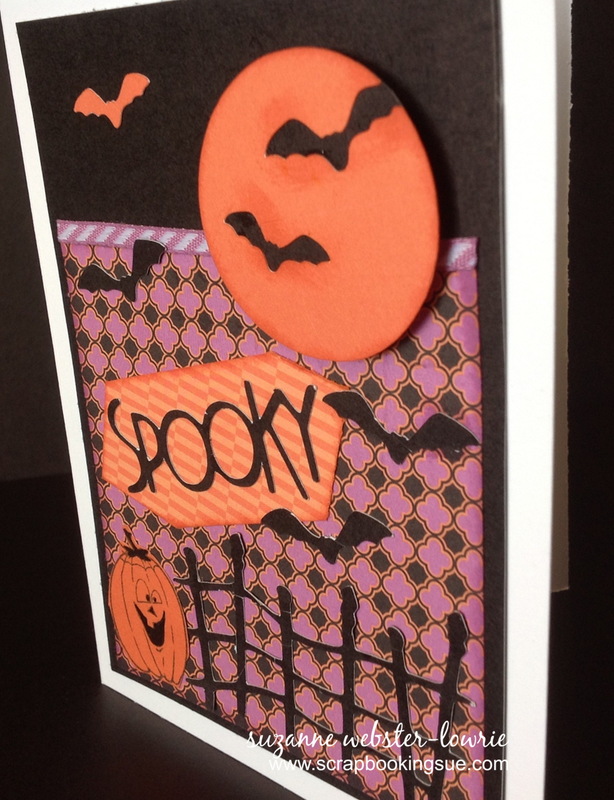 I stamped “Happy Halloween” in a spot where it would be the most hidden when the card is closed. 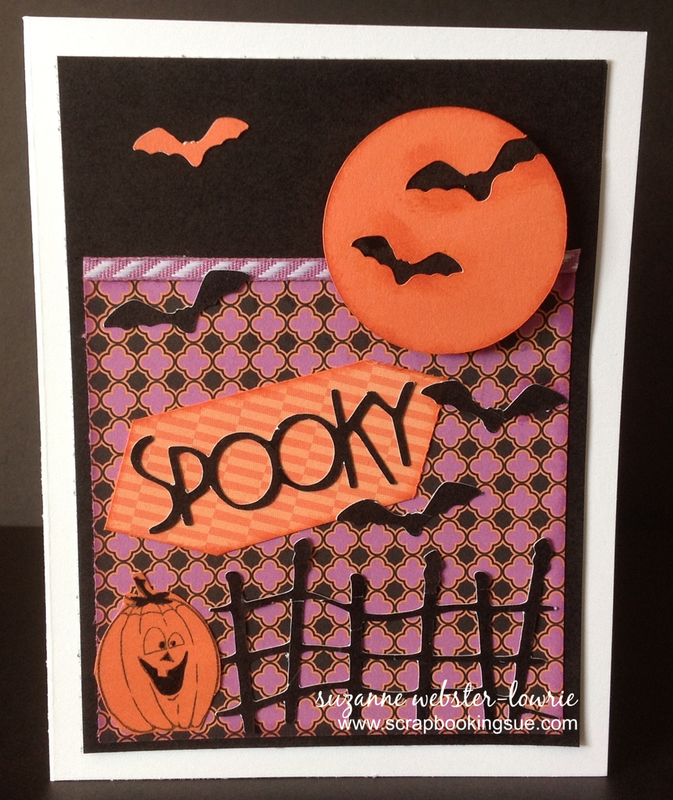 I brought out my “Frightfully Fun” stamp set for the Halloween cuties and sentiment. 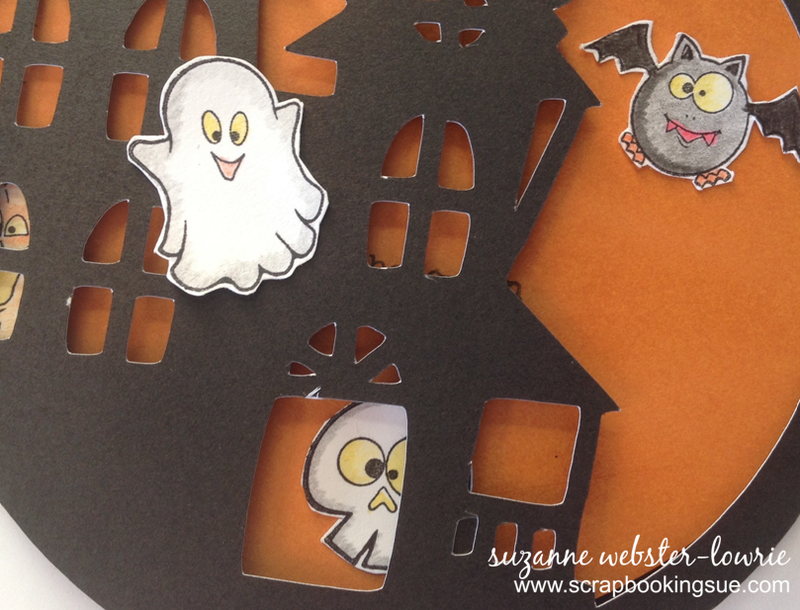 The ghost was glued on the front of the card, and the other cuties were glued onto the overlay. This is the quick and easy version of a card like this. You could always add a lot of color, background scenery, etc. to really jazz it up if you wanted! Last Day for the CTMH September Specials! Get the September Stamp of the Month, “Family is Forever” for only $5.00 with your qualifying order! Go here for all of the details. Get the September promotional stamp set “#30yearsofhappy” for FREE with your $30 purchase of current, retail-priced stamps. Go here for all of the details. These 2 offers are only available until the end of day today! Make sure to order now so you don’t miss out! Montana Residents receive a FREE Cricut Collection ($99 value) when you join my team by October 5, 2014! It costs only $99 to join my team (plus, you can earn your kit fee back… as me how!) and you will receive over $450 in products! Click here for all the details. FREE Cricut Cartridge for Montana Residents! Calling all Montana Residents! Get a FREE Cricut Collection when you join Close To My Heart this month! Wow! Residents of Montana that join Close To My Heart this month, will receive a FREE Cricut Collection of their choice! It’s true! It’s only $99 to join my team, and you will receive well over $400 worth of products! New consultants now have the choice between 2 consultant kits: (click on the pictures to see exactly what’s included in each kit!). New Consultant Scrapbooker’s Kit – over $365 in products for only $99! New Consultant Cardmaker’s Kit – over $370 in products for only $99! PLUS, with this awesome promotion, you will also have your choice between 3 Cricut Collections, each valued at $99! To find out all about each Cricut Collection, please click on the links below. Each link will open in a new window with detailed information, collection contents, links to the Cricut booklets to see the cartridge images, as well as a short video on each collection. Everything you need to know to make choosing your FREE Cricut Collection a breeze! So, why is this special just for Montana residents? Well, back in April of this year, CTMH ran this same promotion for everyone. At that time, Montana was going through some new legislation and prospective new consultants of that state were not fully able to participate in this great promotion. Now the promotion is back for Montana residents! From September 5th – October 5th, 2014, any Montana resident (with a Montana mailing address) may take advantage of the free Cricut Collection promotion when they sign up as a new CTMH consultant! Cricut cartridges will not be back ordered for this promotion, so sign up TODAY so that you will receive the cartridge of YOUR choice! You can find more information on the New Consultant Kits, here. You can find more information on the Cricut Collections, here. You can find more information on Joining My Team, here. You can skip straight to the CTMH application form, here. You can contact me by email, or with the form here. I look forward to hearing from you!